At the mound, the Four Horsemen of Apokolips discuss their situation. Azrauez discusses their good fortune to find morphogenetic technology hidden inside the pyramids, but Rogga stil focuses on their potential threats: Oolong Island summoned them, they may also banish them. Though Azraeuz acknowledges that it is possible, Zorrm is unconcerned, pointing out that the technology was Apokoliptian while they are now of Earth. Rogga points out that the technology was made from Earth materials and hands, making it as much of Earth as it was Apokolips, and Azraeuz and Yurrd agree that Oolong is more dangerous than they originally thought. Once their bodies are ready, they will bring war to Oolong. On Oolong Island, Mr. Terrific is overseeing an influx of materials to help accelerate recreating the portal to return the Horsemen to wherever they came from. Mr. Terrific warns Veronica Cale that if she invokes national security, they pull the plug. Cale asks if he’s speaking for the Justice Society or for Checkmate. In Bialya, Superman, Batman, Wonder Woman, and Snapper Carr discuss the recent events on Oolong. Snapper says that several corporations are helping out, including Wayne Enterprises and Kord Industries, but there are security measures in place to prevent Cale from trying anything funny. Batman, however, is more interested in why Snapper is here. Reluctantly, Snapper explains that he has been a deep cover Checkmate operative since Brother Eye and the O.M.A.C. debacle, observing events in the metahuman community and relaying it back to Checkmate. Basically, he’s been spying on the Justice League since the Infinite Crisis. Superman says it stops now, but Batman realises that he’s actually needed: Snapper knows them personally, meaning he will be sympathetic to the League to allow them to work, but will recognise when they’ve lost control of a situation and be able to warn Checkmate. Contacting Mr. Terrific, Batman asks for a a brief on the situation. Terrific says that they’re making serious progress, but certain parts of the technology are essentially alive, and they’re resisting reprogramming. For all intents and purposes, they need to be talked into helping. Terrific asks to try and buy them some time. Noting that the mound is a huge target with nothing living for miles around, Wonder Woman comes up with an idea: throw a comet at it. Since they don’t have any comets handy, Superman collects a chuck of ice from the Arctic and hurls it at the mound, hoping the ice will better diffuse impact without hindering the destruction. The ice hits the mound dead centre. However, the corpses begin sizzling with energy, and the mound explodes into a firepit. Still unaware of what happened, the JLA and Snapper are left without answers, but a bad feeling. At the firepit, the Four Horsemen are fully reborn in their new bodies, much better suited to contain their essences. Zorrm says that Black Adam and others will come to oppose them, but Azraeuz has learned of Adam’s downfall through the corpses he controlled, much to the displeasure of Yuurd (who has taken the form of an anthropomorphic heyna). Rogga brings their attentions back to Oolong Island, and promises to bring his province to them. Azraeuz offers access to the Mortuus Dominion, which will allow Rogga to command the dead. Azraeuz dispatches Yurrd and Zorrm to deal with the JLA. The JLA communicate with Mr. Terrific on what happened, but he is just as in the dark as they are, and tells them that they are authorised to do whatever is necessary to stop the Horsemen. However, Superman’s wound begins to act up, and Wonder Woman says that it’s infected. 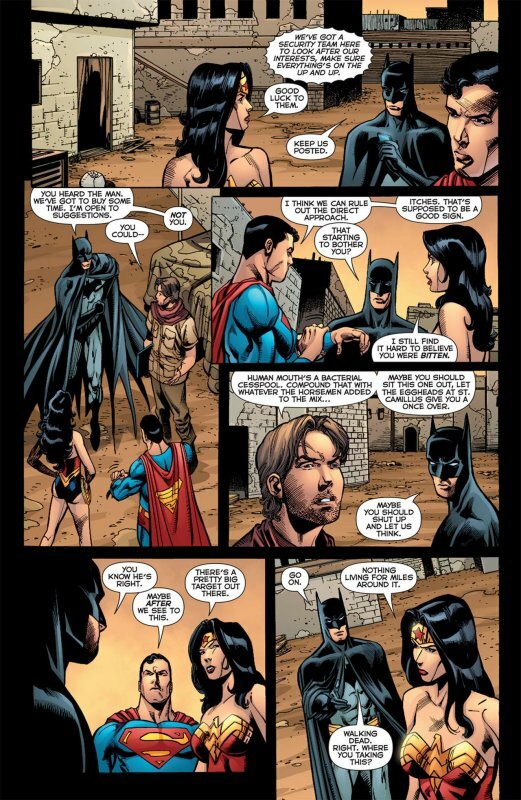 Batman reminds them that Black Adam defeated the Horsemen, but Wonder Woman points out that she’s the only one whose powers are pantheon based like his. Deciding that they need more intelligence, Wonder Woman flies off to see what is going on. Observing a massive dust cloud, she flies in. At the same time, another cloud appears before Superman, Batman, and Snapper. Yurrd and Zorrm step out, and Superman doubles over in pain. 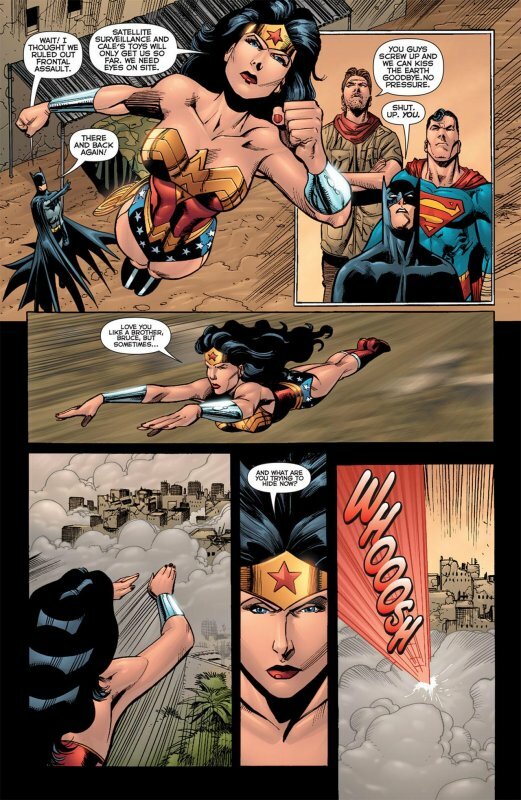 Flying through the cloud, Wonder Woman can smell death all around, but doesn’t see any buildings. Suddenly, she smells saltwater and surf, and sees that she’s on Oolong Island. At the compound, Veronica Cale and I.Q. 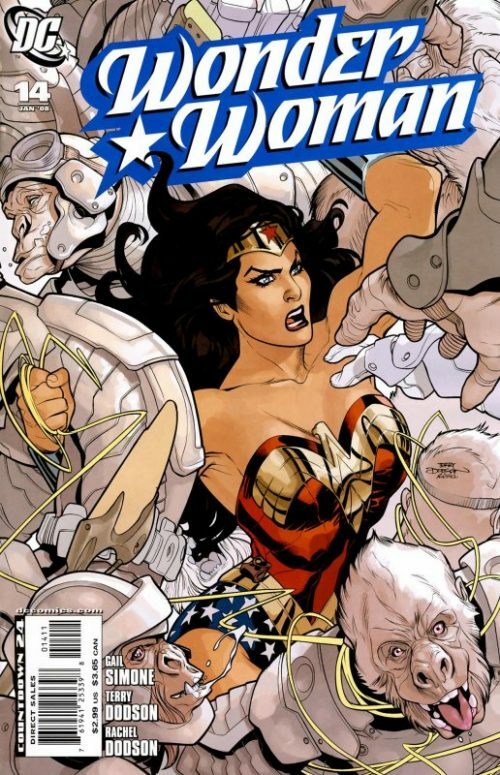 observe the cloud, which is undetected by their sensors, and see Wonder Woman. 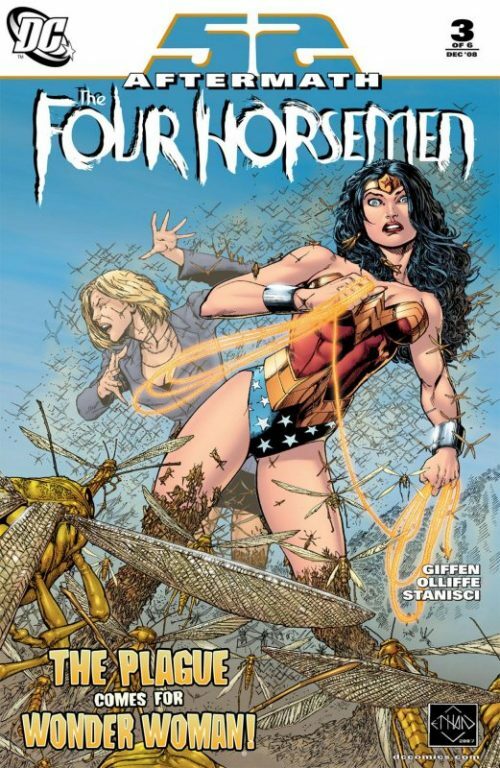 Cale is outraged that the JLA ignited the firepit and accelerated the Horsemens’ rebirth, but I.Q. points out that they did use ice to diffuse the impact, and they probably should have warned the JLA what the Horsemen were planning. Suddenly, I.Q. sees something in the mist, and hands his binoculars to Cale. Observing the beach, Cale orders the compound sealed. Out of the mist, the Four Horsemen of Apokolips have sent their army…and it is the the army of the dead..